(CNSNews.com) - Chinese holdings of U.S. Treasury securities are 10.0 percent below their peak level which was attained in November 2013, according to data published by the U.S. Treasury. 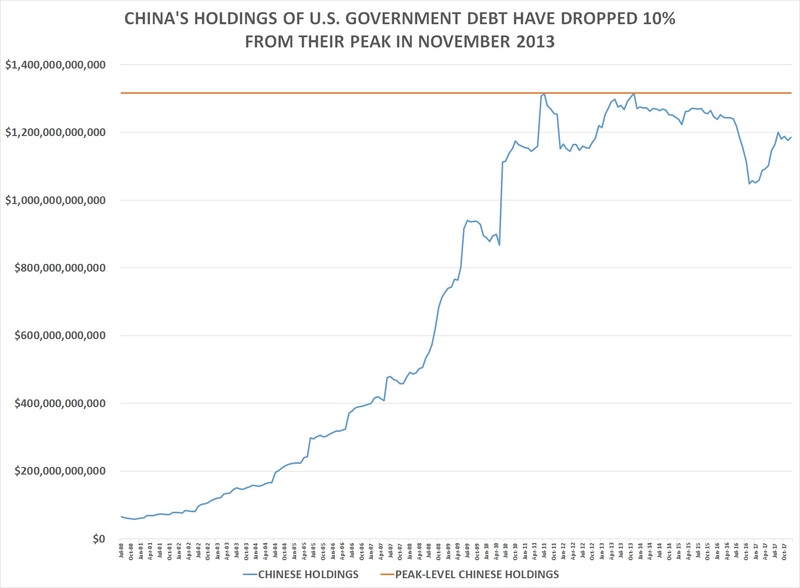 U.S. government debt held by entities in the People’s Republic of China peaked at $1,316,700,000,000 in November 2013, according to the Treasury. At that time, the total debt of the federal government was $17,217,151,645,105.86. That debt included both $4,936,025,387,118.78 in “intragovernmental debt,” which is money the Treasury has borrowed out of federal trust funds (such as the Social Security trust funds); and $12,281,126,257,987.08 in debt held by the public, which includes marketable U.S. Treasury securities such as Treasury bills, notes and bonds. Between November 2013 and December 2017 (the latest date for which the data is available), Chinese holdings of U.S. Treasury securities dropped from their peak of $1,316,700,000,000 to $1,184,900,000,000—a decline of $131,800,000,000 or 10 percent. At the same time, the federal government’s debt held by the public increased from $12,281,126,257,987.08 to $14,814,721,127,803.77. That is an increase of $2,533,594,869,816.69—or 20.6 percent. Also at the same time, the Federal Reserve’s ownership of U.S. Treasury securities climbed from $2,163,666,000,000 on Nov. 29, 2013 to $2,454,219,000,000 on Dec. 27, 2017—an increase of $290,553,000,000 or 13.4 percent. Japan’s holding of U.S. government debt peaked at $1,241,500,000,000 at the end of November 2014. As of December 2017, Japan’s holdings were $1,061,500,000,000—a decline of $180,000,000,000 (or 14.5 percent) from their peak. However, entities in the People’s Republic of China and Japan remain by far the most significant foreign holders of U.S. government debt. China with its $1,184,900,000,000 in U.S. Treasury securities ranked No. 1 as of December 2017. 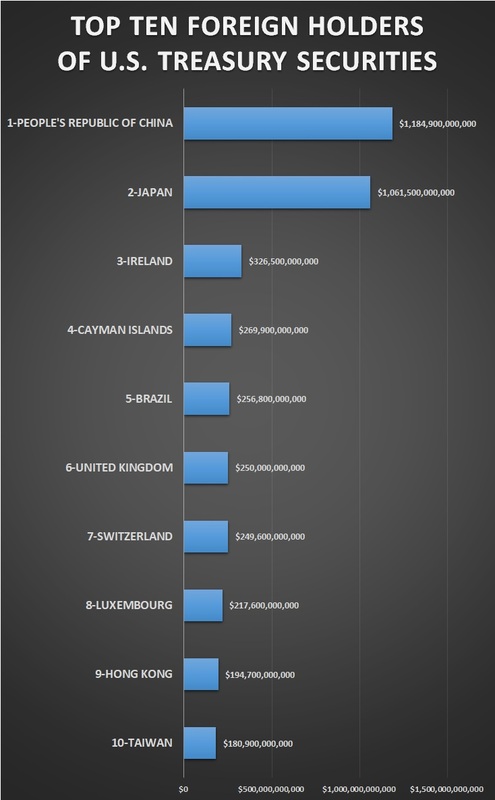 Japan with its $1,061,500,000,000 in U.S. Treasury securities ranked No. 2. Ireland with $326,500,000,000 ranked a distant third; the Cayman Islands with $269,900,000,000 ranked fourth; Brazil with $256,800,000,000 ranked fifth; the United Kingdom with $250,000,000,000 ranked sixth; Switzerland with $249,600,000,00 ranked seventh; Luxembourg with $217,600,000,000 ranked eighth; Hong Kong with $194,700,000,000 ranked ninth; and Taiwan with $180,900,000,000 ranked tenth. The White House Office of Management and Budget estimates the federal government will run an 832.63 billion deficit in fiscal 2018, a $984.39 billion deficit in fiscal 2019, a $986.94 billion deficit in fiscal 2020.